As a declaration of interest, I will start by stating that I’m married to someone will have to pay the 5.99% council tax rise (if agreed tonight). This evening, all 65 councillors at Wirral Council have been invited to a public meeting in the Council Chamber at Wallasey Town Hall to decide on the Council’s Budget for 2018-19 (1.4.18 to 31.3.19) starting at 6.00 pm. The ruling Labour administration (who hold 38 out of 65 seats) proposed their Budget at the Cabinet meeting held on the 19th February 2018. However both the Conservative Group of 21 councillors and the Liberal Democrat Group of 5 councillors have proposed alternatives to be considered this evening. The Conservative Budget objection refers to a 5.99% council tax rise as “excessive, especially for those on fixed or low incomes”. It asks for a reduction in the costs of professional management consultants (listed in their objection as £2.686 million), deletion of the car parking charges in coastal areas (at a cost of £250,000) and removal of the car parking charges in country parks (£150,000). 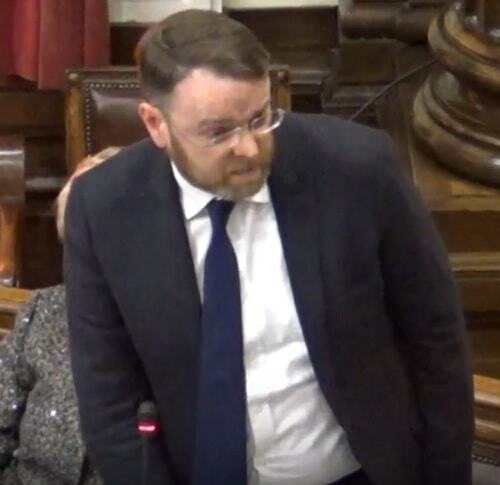 It calls for the Council’s newspaper Wirral View to end, at a saving of £140,000 and for school crossing patrols that were previously removed to be reinstated at a cost of £90,000. Finallly it asks for the Labour Cabinet’s Budget recommendations to be rejected and for Cabinet to submit fresh proposals to Council within the next 5 working days reflecting the views in the Conservative Budget objection. iv) ending the Wirral View newspaper (£140,000 saving). Their budget also comments on the use of agency staff in Wirral Council’s Children’s Service, the democratic accountability of the Wirral Growth Company Ltd, the purpose behind the purchase of the Europa Building (Birkenhead), the use of consultants, consultation, planning applications, the use of reserves and other matters. « What were the reasons behind the 24 hour RMT strike over guards on the Merseyrail network? Well done Liberal Democrats, a nice budget plan. Interestingly, one Liberal Democrat councillor (Cllr Alan Brighouse) voted against the Liberal Democrat Budget amendment, but this may have just been a mistake on his part out of tiredness after nearly 3 hours of meeting! So it was voted down by a margin of 51 votes. What’s in the nomination papers for the Conservative and Labour candidates in Leasowe and Moreton East and the nomination papers for the Labour candidate in Liscard?